All humans are not mentally strong. 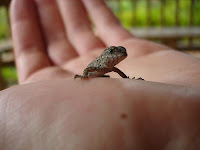 even the mentally strong people, get afraid, when they see small creatures, like LIZARD. and there is no question, if that person is bit soft in nature. they are absolutely crazy. Few days back, i was playing cards, with 4 of my friends. Actually my friends are renting in a flat, just near to my University. they are just too good to be with. As, we were playing, suddenly, my 1 of my friend, threw all his cards and just started shouting and screaming like any thing. He was even crying like a small child. at 1st i really dint no what was happening. but after a while i found that, it was because of a small lizard, which we saw hiding itself. but the funny part is that, even after that, he was crying for 10 Min's. ha !!! Actually, i have seen many times, people getting afraid of LIZARD. but i have never seen anything like, what he did that day. simply crazy. but, after talking with him, i found that, he is afraid of lizard and some other small creatures from childhood. so, he even avoids seeing that. He has to change. these simple things can make him feel worse and can make him feel afraid of all simple things, which is JUST REALLY BAD. Lizards....I know most of the people scared of it...till today i havent seen it harming any of the humans. According to my knowledge some species of the lizards are poisonous like its skin are poisonous, its liquid waste (Urine) if contacted with human skin causes rashes or allergy...but not all of them. I can understand why people get frightened of lizards, because of its mythological or supersitious reasons, e.g., a lizard moving in the ceiling of the room, if falls on a particular part of body like hand it depicts of some bad omen. I really donno how true this is as this is been followed from ages. My wife is a staunch believer of lizards' fall and also the worst enemy. haha thts pretty hilarious. u should consider giving him some sort of therapy to lose his fear.